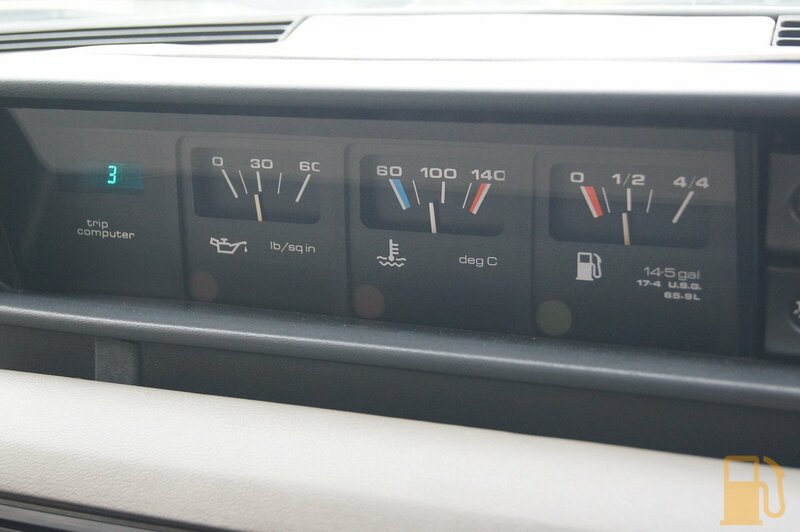 Rover SD1, An Update…. and 100th Post! Oh hey, it’s been a year…. and 100 posts! Tastes Like Petrol is almost a year old now, and it’s come a long way from the initial idea, to what has now been 100 posts. Its serving its purpose of being an outlet for my automotive exploits well, and I have some more super awesome interesting posts coming up in the next couple of months that should be enjoyable. When I started this site I never really expected it would have as much interest as it has, and im just happy if anything I post helps anyone with their cars. Right, back to the Rover. I had an interesting moment the other day when I took the Rover out to catch up with some friends. The give away that something was amiss was when the temperature gauge was dead. It did nothing; just sat down below cold. The car still drove well, I had plenty of coolant, and the engine wasnt cold or boiling, so I continued on as normal. 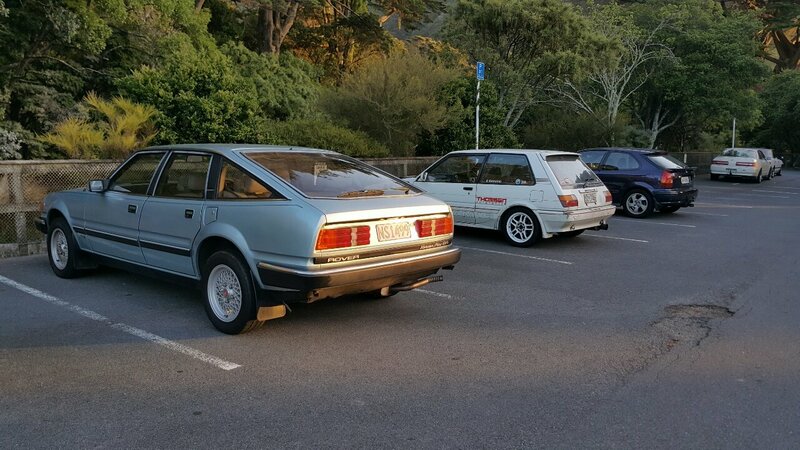 It was a great drive around the bays. 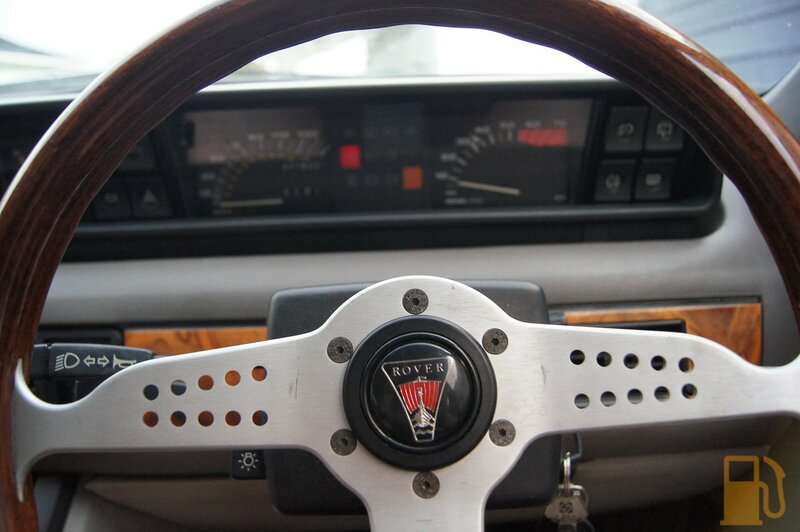 The new wooden Momo steering wheel was an absolute pleasure to pilot the boat around with; it just felt so much better. It wasnt as slippery as I expected either. I was also seeing 8-9L/100KM on the instant consumption during the cruise, which is awesome. I can live with that sort of economy (although it doesn’t really matter, I’ll drive it even if it was higher than that!). When I got home I decided since there was still a little daylight left, to check out the connection for the temp gauge and see if it was loose. Sure enough it was, so I reconnected it and the gauge worked again… but the engine cut out and decided it didn’t want to start again. I tried wiggling a few things and it still wouldn’t start, so I left it for the night. The next morning I tried to start the car again. It started, but ran really badly, misfiring and being a complete dog. Not good enough. I did some digging, and found the culprit. That damn thing. The front one is the Thermo-time switch for the cold start injector, and the one behind it is the Temperature sensor for the ECU. That one tells the ECU what the coolant temperature is, and it adjusts fuelling accordingly. The fact that neither of the connectors are in remotely good condition gives an idea of what the rest of the loom is like. Both connectors are missing bits of plastic, and neither has their retaining spring clips. 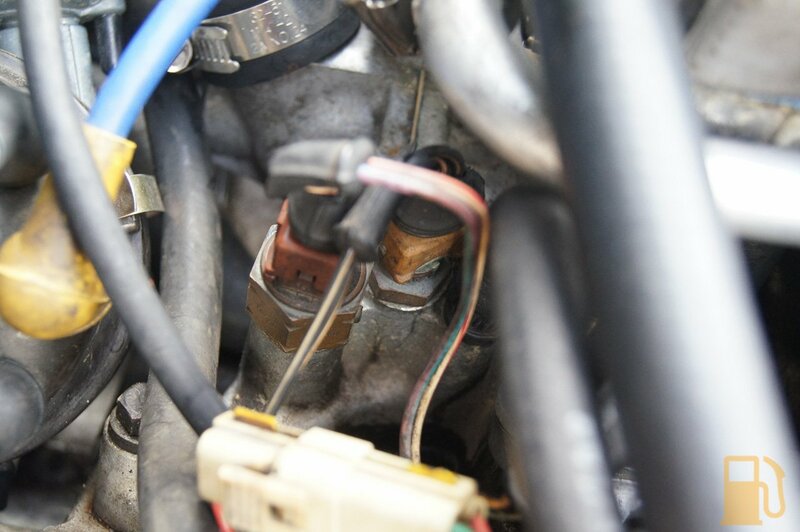 The ECU temp sensor connector, though, is stuffed. It appears water had pooled in the connector for a period of time, and rusted the connector. Thankfully the sensor itself looks OK after a clean. A good clean with a wire brush and some contact cleaner got them looking usable again. More importantly, the engine started and ran properly again. I took it for a quick run, and discovered an issue that I have had since the start has now gone. Previously it would misfire badly and stop revving over around 4000RPM. I chose to ignore it as I didn’t need to rev that high normally, and could diagnose it when Speeduino was installed, but since the sensor was cleaned, it now revs freely to redline and just keeps pulling. Amazing result! With a working engine again, and a good thermostat it comes up to temperature and holds it well. Tomorrow I will treat the car to some love. New spark plugs, oil and filter, front brake pads, and new brake fluid.